Fixed star Alkaid, Eta Ursae Majoris, is a brilliant white star on the tail of the Great Bear, Ursa Major constellation. Other names include Elkeid and Benetnash (Benetnasch). 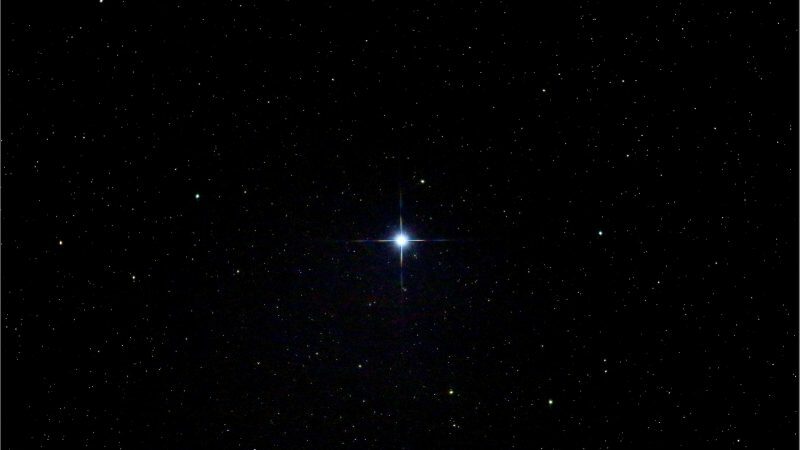 Alkaid is the most eastern star in the Big Dipper asterism. Al Kaid, or Al Qaíid, comes from a variety of words meaning tribal chief, an appointed local governor and the like. 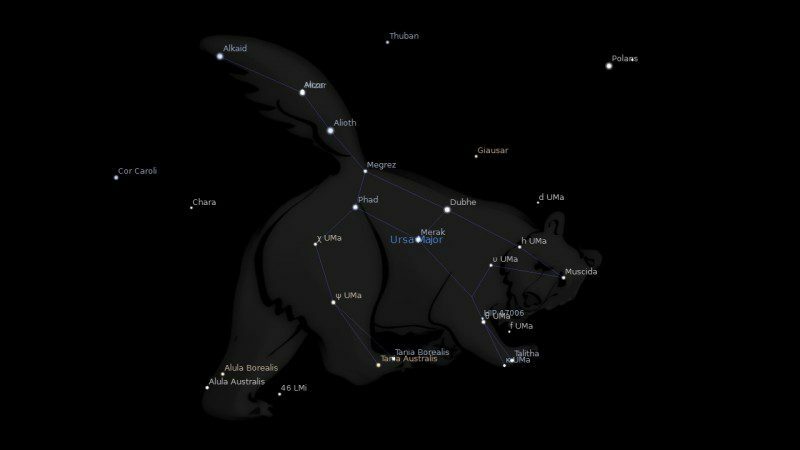 Often written Alkaid, it is η Ursa Majoris, at the tip of the tail. Again, here is that greater note of authority, with responsibility for others, perhaps at a more immediately practical level than in the case of the Prince, Mizar. The full title of this star, Al Kaid al Banaat al Naásh, however, means Lord of the Daughters of the Bier, a funeral theme suggestive of the Weeping Sisters, Alcyone, to which this star is locked in trine aspect. So, then, the service required of the person with it strong on the horoscope may well be in the field of consoling people in distress of bereavement. If we were to give a planetary simile, therefore, something like Moon-Mercury is on the right lines. But Al Kaid is so close in longitude to Zavijava (Al Araph) as to only give a little extra force to the meaning and the Mercury-Mars qualities we saw there. Benetnash, the last star in the Great Bear, means “hired mourners”. If the influence of Benetnash is exercised, an influence of a Mars-Uranus-Saturn nature is present. Experience has shown that many human lives are to be mourned. Reinhold Ebertin made a survey of this fixed star when associated with transits of the major planets over this degree… In accordance with adopted belief of ancient times, this fixed star is supposed to be bound up with the realm of the dead and is therefore associated with death and mourning. In an important position in a mundane map, Benetnash will claim human lives in calamities such as mine accidents, collapse of houses and bridges, mountain slides, earth tremors and weather catastrophes. Uranus was in exact conjunction with Benetnash at the end of July 1968. This time was marked with extreme tension between Prague and Moscow, followed later in August by the Russian takeover of the CSSR. Tank crews occupied a Damascus broadcasting station. At the same time there was a rebellion in Yemen, racial strife flared up in Indiana and the Czech reformers in Schwarzau on the Theiss fought for the freedom of their nation on July 30, as the Russian political big wigs widened their maneuvers in Poland. In the DDR, at the same time, there began a mass movement of the Viet Cong. Bloody riots took place in Mexico, and at least 100 human lives were lost when a volcano erupted in Costa Roca. 1. Gods, Goddesses, and Mythology 11, Scott C. Littleton, 2005, p.1338. 2. The Living Stars, Dr Eric Morse, 1988, p.51, 147. 3. Fixed Stars and Their Interpretation, Elsbeth Ebertin, 1971, p.55. 4. Fixed Stars and Judicial Astrology, George Noonan, 1990, p.35. 5. Fixed Stars and Constellations in Astrology, Vivian E. Robson, 1923, p.65. How can you describe, please, Sun conjunct with Alkaid on exactly orb in the natal chart, with Uranus and Pluto very almost here in a stellium with Sun ? I feel living very deep and the same time in other worlds…I know it counts and other aspects and planets…Thank you ! This is difficult for me to describe although this star is between my Pluto 24 and Sun 29 Virgo. I can only really go on what the other authors have written above. But a sense of power makes sense and I definitely have a strong affinity with ancestors. Have even cast horoscopes back many generations. Last time I was put under for surgery I had very strange experience as if almost dying and very scared then instant peace. I asked the surgeon later and he said there was nothing strange about the anesthetic.I did feel as if I was seeing others in the room.